Have you tried to change the theme for just one slide in your PowerPoint 2008 presentation? Are you frustrated because there is no "Apply to Selected Slides" option like there is PowerPoint's Windows counterparts? You are not alone. I struggled with this for what seemed like forever until I discovered the easy, albeit completely hidden, solution. In PowerPoint 2008, right-click (or [Command]-click if you do not have a right-clicker) a slide and choose Duplicate Slide. Hold down the [Shift] key and select both the original slide and its duplicate. Right-click (or [Command]-click if you do not have a right-clicker) either slide, and choose Slide Theme > From Gallery. You can now select a new Slide Theme from the gallery and delete the duplicate slide. Who's Who books do have their grammar right. The proper usage is Who is who. But wait, you might be thinking, just last week, Jennie, you were telling us that we use who as the subject and whom as the object. Isn't the second who in Who is Who an object? If you can ask that question, you have reached at least the intermediate level in the game of correctly choosing between who and whom. At this level, we must distinguish between action verbs and nonaction, or linking, verbs. The verb to be and all its forms, including is, are, was, were, will be, has been, and all the other forms for the 12 tenses, is a linking verb. It links a subject to one of three things: an adjective describing that subject, a phrase identifying the current location of that subject, or a noun or pronoun that refers to the same person or thing as the subject. So if a pronoun is in either of the noun positions in a sentence with a linking verb, the pronoun uses its subject form. One thing to remember for these examples: there are no additional words after the word who at the ends of these sentences. If there are words after the word who, then you must enter the advanced level in the who vs. whom game. We'll go there next time. I'll be leading one session at the The Adobe Learning Summit 2011. This conference is for Learning professionals who want to learn the latest from industry leaders and Adobe experts. This one-day event is a unique opportunity to become an active participant in the community that's shaping the future of eLearning design and development. Join leading eLearning designers, developers, trainers, industry experts, and Adobe product teams in a collective explosion of information, imagination and inspiration. I'll be leading two sessions at the Conference for Software User Assistance. The focus of this conference is on developing the best possible user experience for all types of software applications through well-designed interfaces as well as helpful and accessible support information. 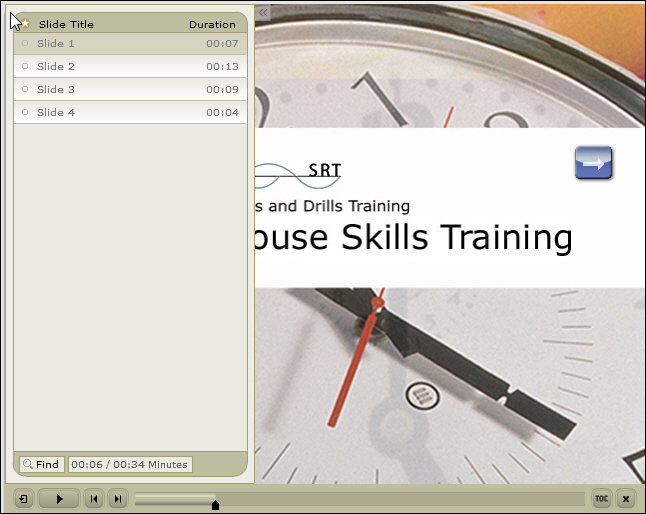 I'll be teaching four hands-on Captivate sessions at ASTD's fast-approaching TechKnowledge conference. This conference welcomes professionals who focus their daily attention on the design and delivery, management and strategy of technology and learning. They will come together alongside 70 exhibitors in the learning technology space to learn, network, and move people forward through the application of learning and technology. It's likely that at some point you'll be asked to share the content within your Help system with members of your team so that they can provide feedback. You could post your generated Help system on a web server somewhere, ask reviewers to use the Help system and then provide feedback. The problem is what to do with and how to manage the feedback you are likely to receive. The new RoboHelp 9 includes a handy Create PDF for Review option that will allow you to create a PDF that reviewers can open with the free Adobe Reader. Your reviewers can use Adobe Reader to add comments. The PDF stores those comments and you can import them directly into RoboHelp. Once the comments have been imported, you can accept or reject the comments, just as if you were using the Track Changes feature you'll find in word processors like MS Word. Here is how the PDF Review process works. 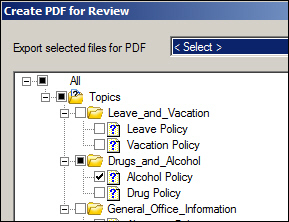 From within RoboHelp, choose Review > Create PDF for Review. The Create PDF for Review dialog box opens. By default, every topic in the project is selected and will be sent for review. You can select as many items to include in the PDF as you like. You can decide to save the PDF locally (and later post it to a server) or send it as an e-mail attachment. Your reviewers must have the Adobe Acrobat or Adobe Reader 9 or newer to add comments to the PDF. 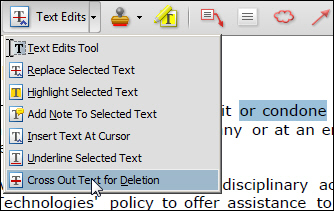 Shown below are the Text Edit options found in Acrobat 9. The Text Edit tools were used to cross out some text and replace one word with another in the image below. Back in RoboHelp, all that's left to do is choose Review > Import Comments from PDF. 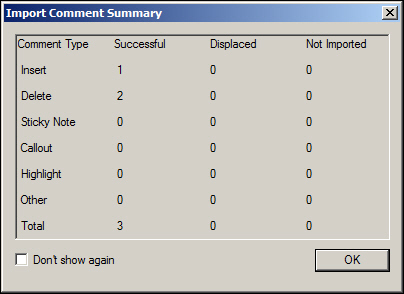 The Import Comment Summary dialog box will open. This dialog box summarizes the number and type of comments that were added to the PDF. You will then use the Review Pane (Review > Show Review Pane) to accept or reject the comments. Sweet! Looking to learn RoboHelp, and fast? I'm teaching a live, online class that will give you the most essential RoboHelp skills... and in just two days. Adding a Table of Contents to your published Captivate project is a great idea... you'll be giving your learners an easy way to navigate through the lesson. Of course, adding a TOC to your lesson comes with a cost... you'll be adding a few hundred pixels to the overall width of your lesson. If your lesson is already quite wide, the TOC isn't going to help. There is a way to have your cake and eat it too. Go ahead and add the TOC to the project via Project > Table of Contents > Show TOC. Then click the Settings button. From the Style area, select Overlay. When you preview the project, there won't be any obvious sign of the TOC. However, if you look in the upper left of the slide, there are two arrows. Clicking the arrows will open the TOC. If you observe the playbar, there is also a TOC button. Clicking the button will toggle between expanding and hiding the TOC overlay. Keep in mind that an overlay TOC has the same functionality as a standard TOC, only it's hidden unless the learner needs it. Best of all, by using an overlay TOC, the width of your published lesson will remain unaffected! Looking to learn Adobe Captivate 5? We offer Beginner and Advanced classes, as well as a half-day course on Advanced Actions. Both Windows and Macintosh developers can attend these classes. Writing & Grammar Workshop: Do I Have to Repeat "a" or "the" in a List? You must order the lumber, as well as the nails, additionally to include the concrete and the sealant, at the very beginning of the planning stages of the project. You must order the lumber, the nails, the concrete and the sealant at the beginning of the project. Do we need the word the before every item? Grammatically, the choices are to repeat the word the before every item or use it in front of just the first item. Here is how the sentence looks without the repeated the. You must order the lumber, nails, concrete and sealant at the beginning of the project. The grammar is correct, but to me, the sentence now sounds too rushed or clipped. It has less of the feel of enumerating multiple items to be ordered. Now it sounds like lumber, nails, concrete and sealant are all one big thing to be ordered as a unit. You must order lumber, nails, concrete and sealant at the beginning of the project. This version of the sentence sounds really smooth, but now the implication is that you are ordering general supplies, whereas including the word the meant that you were ordering the specific lumber, etc., needed for the project. So here we have tried out three different ways to present this list and examined the slight differences in meaning, tone or emphasis. The one thing we cannot do with this list is include the word the randomly for some of the items and not others. You cannot use the on the first, third, and last items, for example, while omitting it from the second item. This rule is called parallelism-items in a list must be parallel in structure. But exactly how you make them parallel is a choice based on meaning, tone and emphasis. Another year's Consumer Electronics Show (CES) has come and gone. What did this year's CES bring to the table for the eLearning industry? Many have coined 2011 "the year of the tablet"...and I believe it. The iPad has been well received among educational institutions. I think this trend in tablet computing will continue, moving beyond fad and into what could potentially make tablets an essential educational tool, and perhaps even a major money-saver for college students who would otherwise dump a large amount of money into hard-copy textbooks. Even though Apple doesn't show at CES, their presence was certainly felt as the competition scrambled to churn out products that would be able to compete with the ever-popular iPad. There are still plenty of people who just can't see a place in their lives for a tablet. One of the oft-repeated issues with a tablet is the lack of keyboard. Another issue is the feeling of superfluity of having both a laptop AND a tablet. The Dell Inspiron Duo was a highly anticipated compromise, but unfortunately was met with lackluster reviews. The reviews may have been poor but the idea was solid and many manufacturers threw their take on the tablet/laptop hybrid into the rink at this year's CES. Aside from the Motorola Atrix (which docks to a laptop shell and becomes and laptop itself-cool eh? ), there wasn't a whole lot of new news on the smartphone front--mostly just improvements on existing technology and performance. Every little bit, however, brings us one step closer to broader mLearning implementation. Technical communicators can rejoice... the latest version of Technical Communication Suite was just released by Adobe. According to Adobe, version 3 of the suite is a "complete single-source authoring toolkit with multichannel, multidevice publishing capabilities." 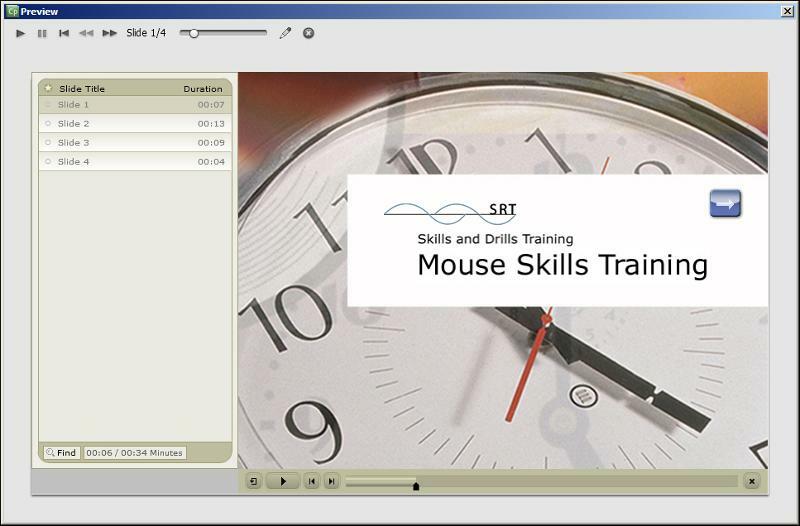 Technical Communication Suite 3 includes FrameMaker 10, RoboHelp 9, Captivate 5, Photoshop CS5, and Acrobat X. To learn more about the suite, read the article written by Adobe's RJ Jacquez. To purchase the suite, contact Adobe's Thomas Deems at 206.675.7076.